Bank Synchronization. I have multiple accounts linked to the same login. Can I select which ones to synch? 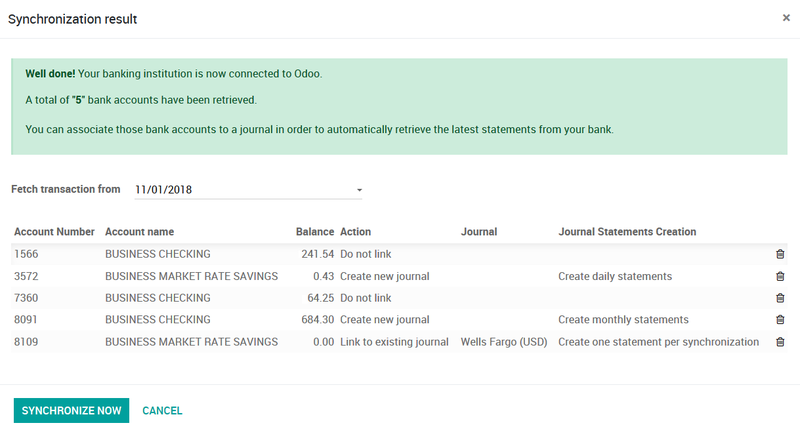 Odoo supports the creation of bank statements that are automatically synced with my bank. I would like to select which accounts are participating in automated reconciliation. I don't want all Bank Accounts that I can access to be synched. I am using Wells Fargo if it makes a difference. Once you have authenticated with your Bank after selecting it during setup, you will see a wizard listing all Accounts you have access to. For each one you can decide IF you want to synch, WHERE and HOW OFTEN.